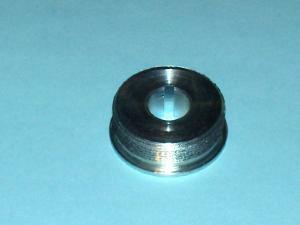 1/2” ID x 1/2" wide Adaptor for freewheel sprockets. Has a 1/8" full key way with 1.375 x 24 tpi OD CW - right hand threads with zinc plating. This Freewheel sprocket adaptor will fit the following single and multi speed freewheels with 1.375 x 24 tpi CW - right hand threads. They also can be used with Track Cogs. 16 tooth 1/2" x 1/8"
16 tooth 1/2" x 3/32"
17 tooth 1/2" x 3/32"
18 tooth 1/2" x 1/8"
18 tooth 1/2" x 3/32"
20 tooth 1/2" x 1/8"
20 tooth 1/2" x 3/32"
22 tooth 1/2" x 1/8"
22 tooth 1/2" x 3/32"
Type " FWADP " in the Search box. 1/2” ID LEFT HAND 1.375 x 24 Adaptor for freewheel sprockets .9" wide 2 set screws, 1/8" keyway.